Lightweight and compact Astro Aimer tripod and telescope mount, Fully adjustable from the unique ball and socket adjustment. 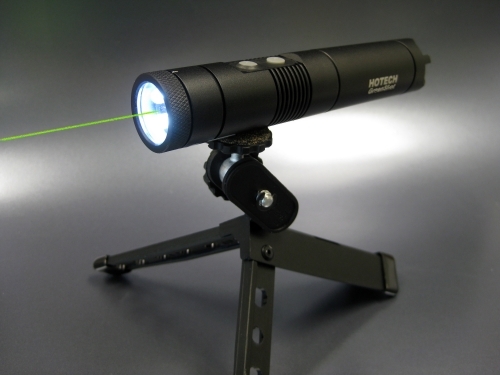 Fold-in legs can be easily clamp in a standard finderscope rail mount with 1.3" base width. High grade Velcro strap allows attachment to telescope trust tube, posts, tree limbs, railings, or any sturdy object. You can skip all the expensive and complicated mount for your Astro Aimer. Installing the mount on your telescope is extremely simple and aligning your Astro Aimer to your telescope is also a swift. 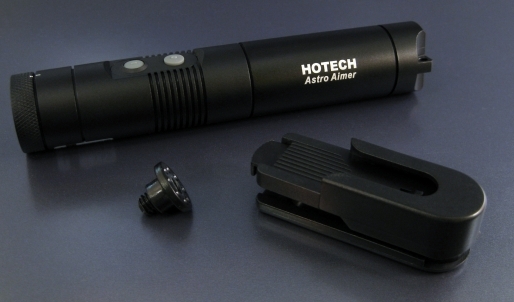 This is the most convenient way to utilize your Astro Aimer for hands-free illumination while working on your telescope, presentation, or at your workshop in the dark. 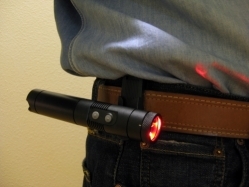 The easy quick laser release from the belt clip provides excellent convenience to use your laser in a snap. 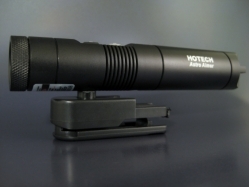 The adjustable directional clip also makes the illumination easy while working in the dark. Activate the flashlight and adjust the Astro Aimer to the various direction for a hands-free lighting so you can work on your project in the dark with both hands. Attractive Astro Aimer Tripod/Telescope mount.